You may use GenoPro without a registration key, however you will be limited to save a maximum of 25 individuals per document. 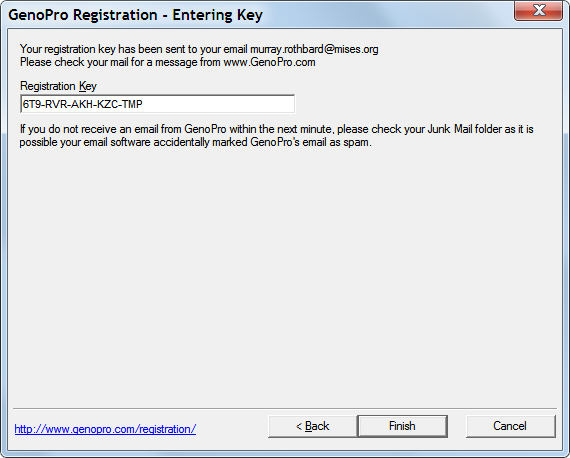 Registering GenoPro is easy: you supply your email address and we send you a free evaluation key by email. Your evaluation key enables you to use GenoPro without any limitation for 14 days. GenoPro displays this registration dialog when you start GenoPro. If you don't see this dialog, it is because you already have a valid permanent registration key or you are running GenoPro on a site license. If you wish to see this dialog, go to the Help menu, click on About GenoPro and then click on the button Purchase GenoPro. To request your free evaluation key, select the first option (I want to request a free evaluation key) and then press the [Next] button. Then, enter your name, organization, country, email address and pres the [Next] button. The only mandatory field is the email, as we need a valid email address to send your registration key. GenoPro will send your registration key by email. 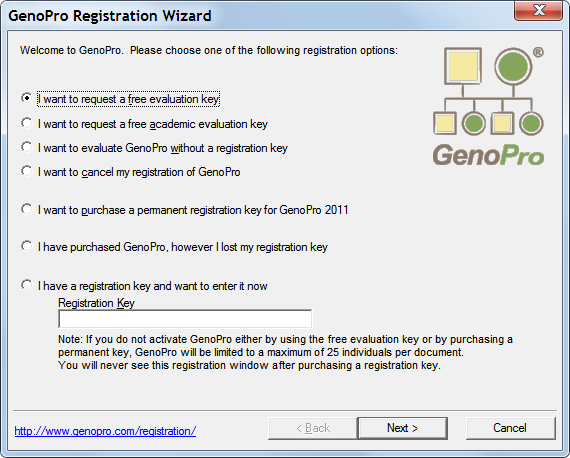 Copy & paste your evaluation key and your ready to fully use GenoPro! Once your entered your key, press the [Finish] button. GenoPro will confirm your key is valid. When you request a registration key (or try to resend your key or password), the server sends you an email immediately. If GenoPro displays a message the email was sent successfully to your inbox, it means your mail server acknowledged receiving the email from GenoPro. try to send the email immediately, email can be slow down by greylisting, spam filter and various network error but you should receive it within 5 minutes. Check your Junk Mail folder! The server GenoPro.com sends thousand of computer-generated emails per day, and it possible your software filtering junk mail incorrectly assumes the email from GenoPro is spam. Double-check you typed the correct email address. It is easy to make a typo while entering your email address. Wait 5 minutes and try again. Many servers (including GenoPro.com) are using greylisting to reduce spam. If you see an error message where the email was rejected for "policy", please contact your technical department and ask to remove GenoPro from the blacklist. It is possible your organization purchased a blacklist where GenoPro is considered a spammer (see our story about SORBS for details). Try another email address to get your registration key. If you do not have a second email address, consider creating an account at GMail, Yahoo or Hotmail. We never have problems sending emails to our customers using GMail, Yahoo or Hotmail. Use GenoPro without a registration key. You will be limited to create documents up to 25 individuals, however you may still open documents of any size. 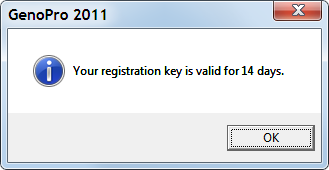 If you attempt to request new key immediately after your evaluation key expired, you will see the message below. You may request multiple evaluation keys, however each expired key has a cooldown period of 180 days before its renewal. 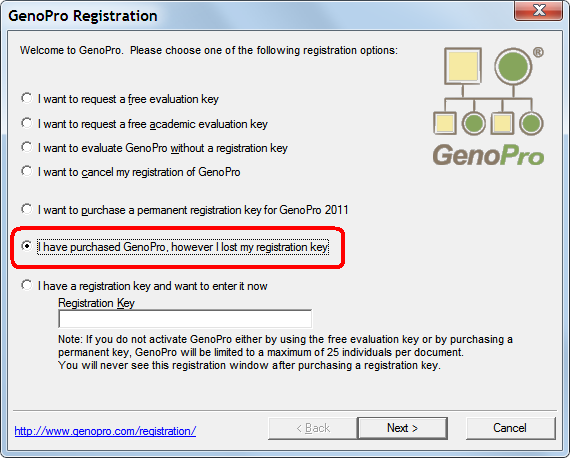 You may continue using GenoPro without a registration key to purchase a permanent registration key. If you have purchased GenoPro however you lost your registration key, simply enter your email address and the server GenoPro.com will instantly send you an email with your registration key. 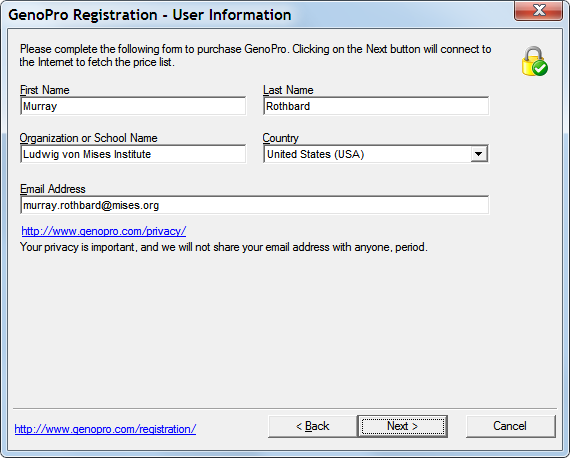 If you have purchased GenoPro using an email address you no longer have access, please use the Account Recovery wizard.